Hypertechnological innovation has always underpin American agriculture. In the later half of the 1800s, for instance, flotillas of proto-steampunk dredge boats [dead links; but go see Mythologizing the Dredge Boaters] plowed through the Illinois landscape, as their their lived-in land-sailors carved canals, straightened rivers and re-knitted its embryonic, post-glacial hydrology, draining and transforming the weedy, swampy, supposedly pestilential swat of the American prairie into the most productive landscape in the world. More recently, a new form of agricultural practice has been developed. Called precision farming, it entails using some of the most advanced remote sensing technology and analytical tools out there. These include aerial and satellite imagery, global positioning systems (GPS), sensors and information management tools (GIS). It isn't quite clear yet, however, if blogging, RSS feeds, Twitter, SMS and MySpace are involved. 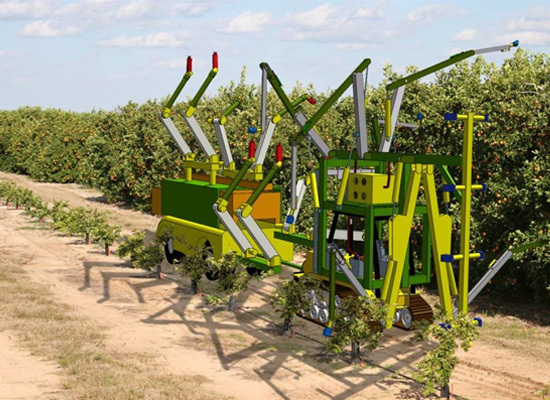 Now we learn, from an article published by Wired and another by the Associated Press, that troops of robotic harvesters are being readied to invade America's industrial orchards and vegetable fields. 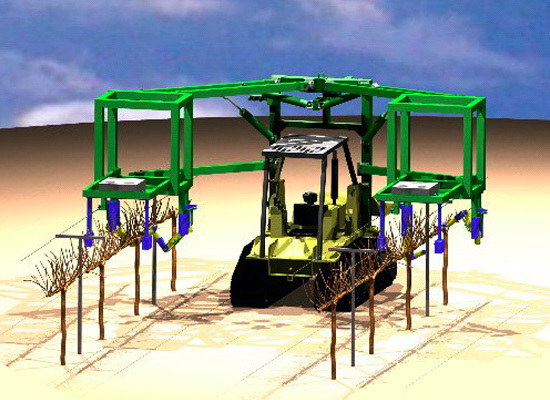 Mechanized picking wouldn't be new for some California crops such as canning tomatoes, low-grade wine grapes and nuts. But the fresh produce that dominates the state's agricultural output - and that consumers expect to find unblemished in supermarkets - is too fragile to be picked by the machines now in use. The new pickers rely on advances in computing power and hydraulics that can make robotic limbs and digits operate with near-human sensitivity. Modern imaging technology also enables the machines to recognize and sort fruits and vegetables of varying qualities. If we forgo the important issues of migrant labor, immigration, social justice, food security and even globalization, with which these machines are entangled, we are left to wonder what would happen, assuming they are networked to the interweb, if they were hacked? 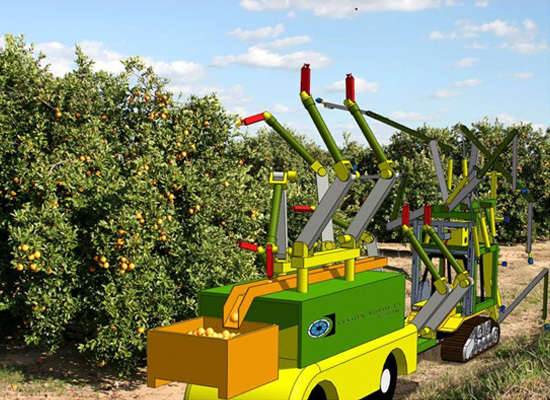 What if China, fresh from infiltrating computers in the Pentagon, were to take control of a platoon of these fruit-picking robots? What if the People's Liberation Army, instead of killing our dear Mister Snagglepuss and cuddly Lady Grizabella by exporting tainted pet foods, they do it by injecting neurotoxins into our locally grown produce? Or what if an installation artist who's been rejected by one too many Manhattan art galleries decides to take his work to a different direction and takes full control of an entire division of pneumatic farmhands? Onto the flat terrain of Kansas he grafts a sort of anti-Jeffersonian grid, whatever that may be. He then carves out a second Double Negative, a homage, right next to the original. And having decided to try his hand on performance art, the artist terrorizes James Turrell at Roden Crater, Turrell's maniacal screams reverberating through the stellar tunnels of his unfinished volcanic observatory; the recording of this will be phoned in to +1 (206) 337-1474. Will Agnes Denes be tempted to make another tree mountain? What will landscape architects make? Even more interesting, what will happen if they become self-aware and go out to pasture? Fitted with solar panels, grazing from one oil well to another, domiciling in abandoned gold mines, what new ecologies will they terraform? how would terrorists from another country get neurotoxins into machines here? This is somewhere between intriguing and terrifying. You might like the work of Belgian conceptual artist Koen Vanmechelen.